You would be pleased to know that a story of mine about the food, culture and heritage of banaras was published in a quarterly magazine Eat Stay Love. The editor of the magazine had read this blog and approached me to write about the lesser known royal and aristocratic cuisine of Banaras. Upon her request I ventured out and talked to many people around the city, interviewed them, enjoyed food with them and documented our food legacy. While talking to all these people, quoted in my text later, I was humbled to learn about the spiritual connect with food, I had known it all I thought but realizing that it still thrives in the home kitchens is what keeps my faith in the goodness of real food alive. Real food that is cooked everyday in home kitchens, sourcing seasonal ingredients with an emphasis on nourishment. Many of the medicinal ingredients used in older recipes were available easily in the past, but there is market near Dashaswamedh ghat where you can get anything you want. Just anything that is used for food which is in season. I was told there are 84 thousand devi devatas in Banaras and each day is dedicated to a few of them, each day is a particular bhog that is prepared and offered to their shrines and temples scattered around the city and that bhog is consumed as a meal of the day by the disciples. This bhog is made with the produce of the season and there is a prescribed period of the year when the produce can be consumed, before or after that the produce of the season is considered bad for health. How easily health was linked with religion, till it all got distorted to a large extent tooooohat it is tday. 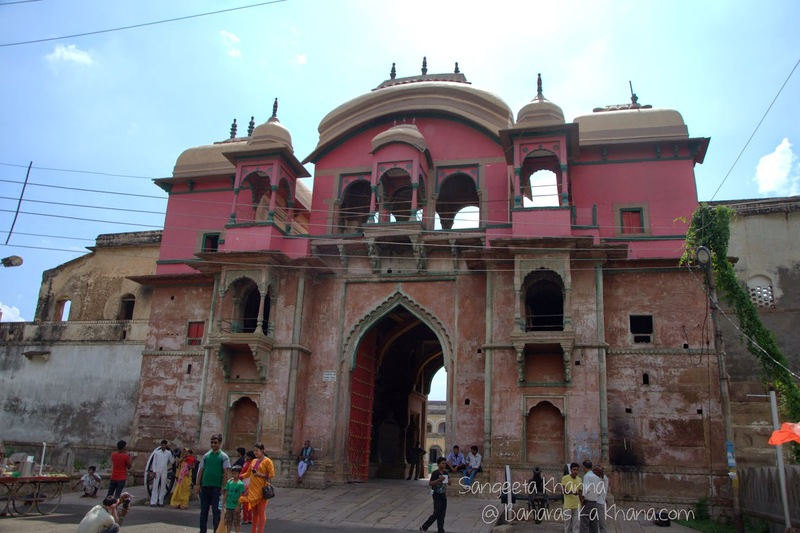 Banaras being an ancient city has been one of the most interesting places to explore. Some parts of the city have been preserved exactly like it was half a century ago (barring the use of plastic in many everyday affairs) and some parts of the city embracing new trends in a very intrepid manner and yet adapting everything into the fashion the city has always existed. On one side you would see men and women following religious rituals around the ghats animatedly like clockwork and on the other hand you see the fanciest of the cars splashing through the puddles of rain water and mud on the narrow rickety roads. Banaras could never boast of good roads thanks to the ancient sewage system that cannot be traced and repaired completely and the heavy load of traffic that corrodes the half hearted construction by administration. The load of traffic is so much that a few lanes of Banaras have been paved with steel tiles. You hear several stories about the city and its divine connect. The city is located on the Trishul of Shiva, the God of destruction and that Shiva tamed the angry Ganga in his Jata (hair) and the ghats of banaras make a crescent shape were Shiva diverts the flow of the mighty river. The pucca ghats of Banaras are made of sandstone, construction and maintenance of ghats was done by religious kings of the past era, it is an engineering marvel in the sense that the whole length of ghats makes a crescent that prevents the river from meandering into the city and change its path which is normal for a river as huge as Ganga. 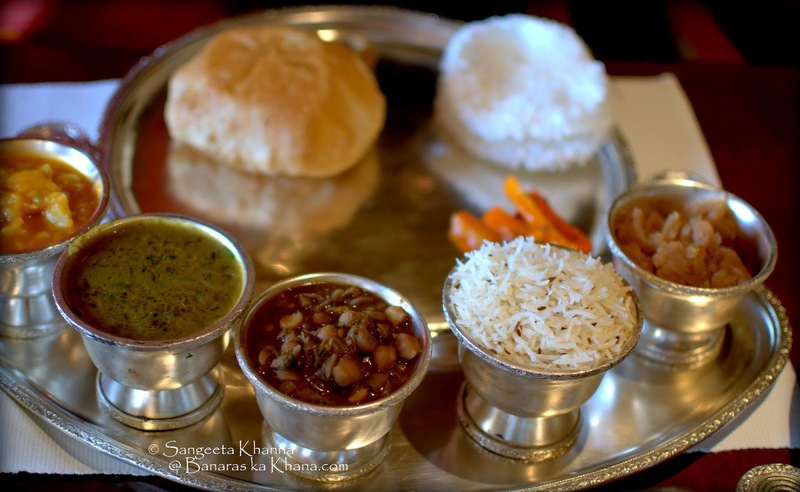 Shiva and Ganga have shaped the culinary heritage of the city as well. The city is considered auspicious for achieving nirvana and moksha. You find several sadhus, widows and pandas around the ghats and temples much like it used to be a century ago. While the influx of sadhus has been voluntary, sadhus being the original Indian hippies, widows are forced to come and live in various ashrams around the city. All these migrants and travelers were dependent on the staple street food culture that has been thriving in Banaras since ages. Also, since death is a celebration in this city, Manikarnika ghat is designated for after death rituals where pandas and doms (people who handle the dead body) perform the rituals with great pomp. The kin of the dead then move on to eat mithai and kachori subzi just after offering the ashes to the ganga. This ritual of eating good food after the last rights of the dead is seen only in Banaras. This is how the religious philosophy is translated through food culture. Shiva is the hippie God who survives on poisonous substances, his job is destruction (of what is not required on Earth) and he celebrates it in his own way by performing Tandav (the dance of destruction). 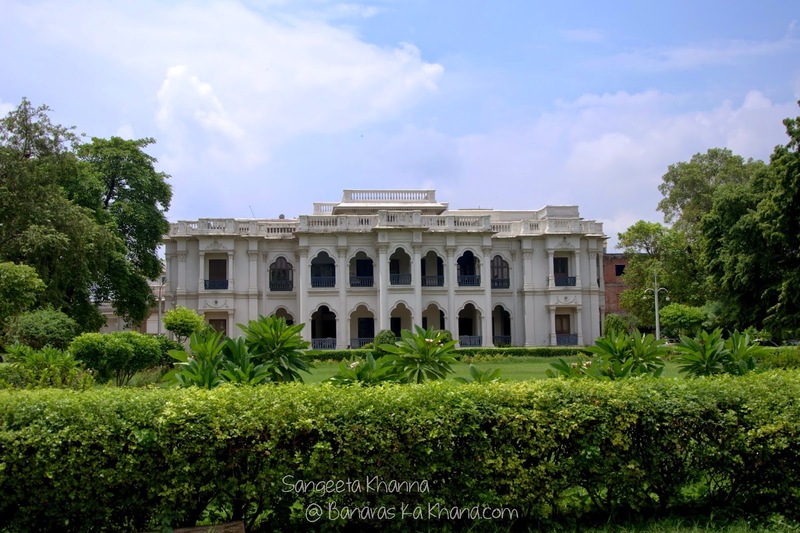 I was told by the GM of the Ramnagar fort Mr. Shiv Bahadur Singh, that raja Chet singh who was the only ruler of Banaras invited Hindu rajas from all over India to build their own palaces and temples around the ghats. 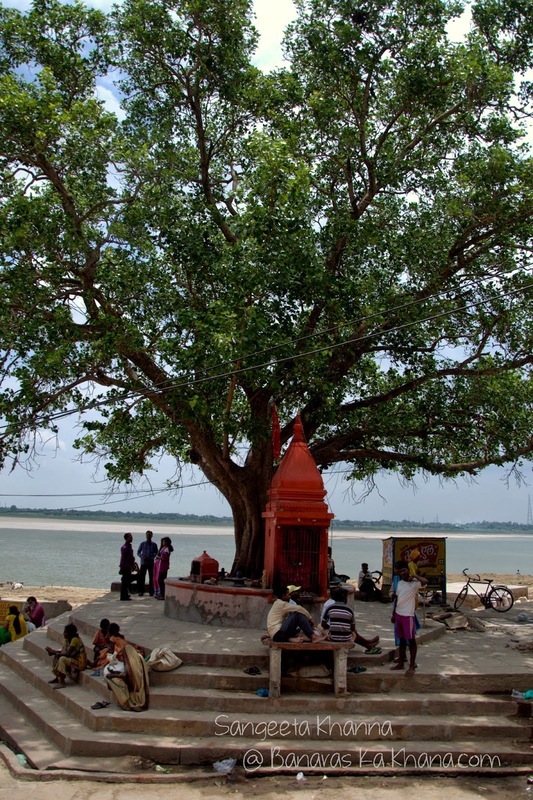 The purpose was to make Banaras a seat of Hinduism and to bring all devi devatas to the city. There is a saying that all 84 thousand deities live in Banaras and every day is a new festival devoted to one or more of these deities. Some or the other sect of Hindus feed the poor and needy every single day on pretext of these religious rituals attached to the festivals. No wonder they proudly say that no one sleeps hungry in the lanes of Banaras. Food is the nerve of the city pulsating with religious faith. Apart from religious reasons, people from all over India came to Banaras for trade. Mr. Prem Narain Shukla, an octogenarian of an aristocratic family informs that It was the Gujrati community who started the ever flourishing textile business in the city as they set up 'soot tola'. Artisans from all over India kept coming to build temples, palaces and for textile design and weaving. Most of the trade and art forms were patronaged by the erstwhile kings having a permanent base in the city. Interestingly, most kings came here with lock stock and barrel, their kitchens and cooks also came to cook for the royal entourage. The temples built by these kings attracted pilgrims from respective regions and thus started the street food culture with hues of all the Indian states. Many of the mithai shops and street food vendors also had royal patronage and supplied special foods to the royal families on order. 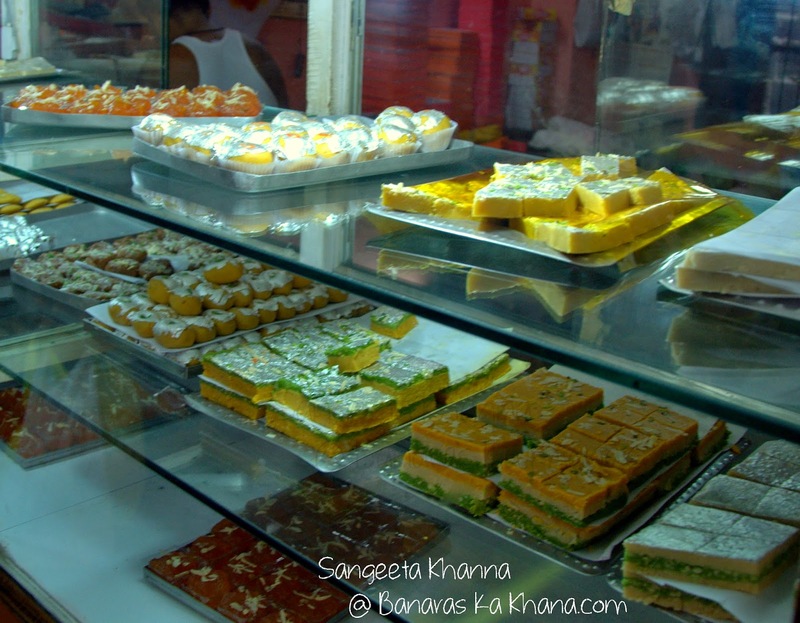 The famous sweet shop at thatheri bazar called Ram Bhandar makes special items just for the royal patrons. To name a few popular sweets, Sooran ka laddu is a diwali staple as told by Mr. Shukla, khoye ka chewda is a sankranti special as informed to us by Mr. Shashank Narain, another heir of an aristocratic family who now runs a heritage hotel in the city, malai gilori and rajbhog are all time favourites or almost everyone, as is the special spongy type rasgullas made with cow’s milk which is considered an everyday sweet. Laal peda is another Ram Bhandar special that is pure milk solids, slow cooked to caramelise the milk sugars and then shaped like small discs crusted with coarse mishri. 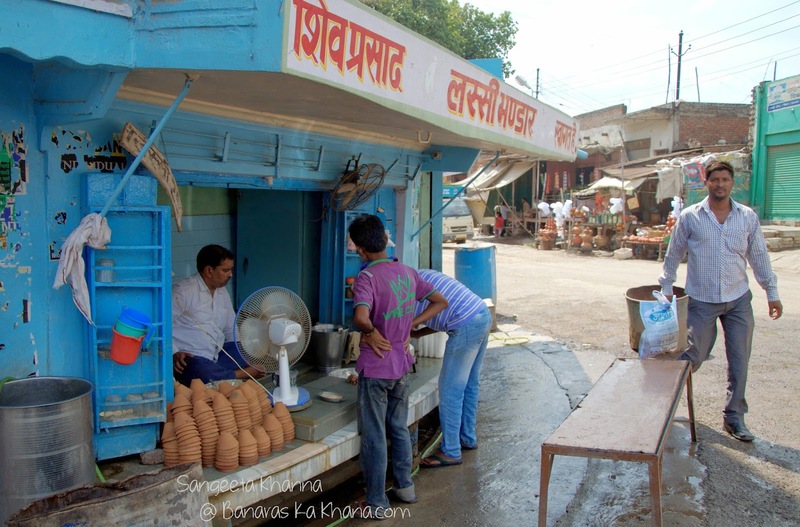 While malai gilori, rajbjog and laal peda have trickled down to other mithai shops and available to everyone now, khoye ka chewda and sooran ka laddu is still a well kept secret, reserved for the raees (aristocrats) who could afford. Incidentally, Ram Bhandar also made mithais like Gandhi mithai, Vallabh sandesh and Nehru laddu during the freedom struggle and their all time famous Tiranga barfi was made during quit India movement in 1942. 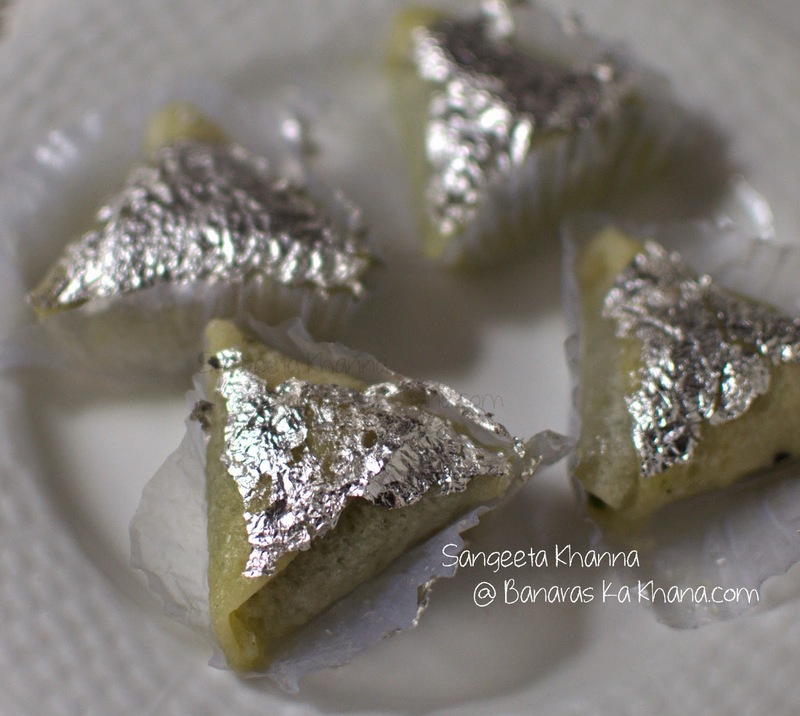 Later this tiranga barfi became popular in many parts of India. While many small riyasat owners and raees nobles ordered special sweets and snacks from the patronised vendors, they took great care of how the resident cooks (called maharaj) procured the produce and cooked meals to perfection in their own kitchens. Women used to take charge of training the cooks but men also took active interest in suggesting recipes and ordering ingredients that were either imported from other countries or were procured from other states of the country. Mr Prem Narain Shukla says that procurement of costly spices like kesar, kastoori, khas root, nagkeshar, chandan, elaichi, pure asafotida etc and fruits and nuts was not compromised and great effort was taken to ensure good quality ingredients used in the kitchen. They always had their own farms for grains, lentils and fresh vegetables and orchards of mangoes and other fruits of the region. That is the reason their food was not comparable to the commoners even though the names of dishes were the same. Home food was always sattvic, no garlic and onion was used in home cooking and all street food vendors followed this no onion garlic rule to their food as well. I have tasted simple day to day food in some of the aristocratic families and have revelled the great taste and simplicity of each individual dish with which the food is served. 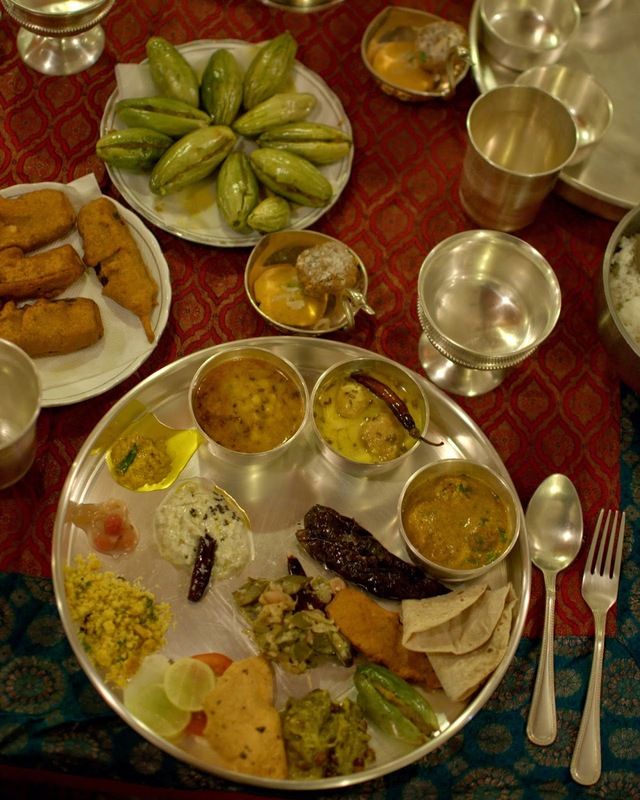 But the aura around food is unmistakable, every detailing is taken care of, each condiment is served neatly and much care is taken to bring in hot phulkas and steaming rice to the table as the guest’s thali needs more helpings. Modern dining tables are used in most such homes now but the old tradition was to bring in individual small tables to each guest wherever the guest is seated in the baithak (the drawing room). Relatives and family friends are always a part of the family dining table but visitors would be served food in the baithak with the same respect and care. Mr. Shashank Narain remembers how everyone used to wait for the winters to have Chuda matar breakfasts. Chuda matar is a special breakfast that is made with beaten rice (poha) and fresh tender peas along with garam masala and milk to moisten it. This chuda matar is always cooked in ghee and the amount of nuts, raisins and the subtle milky sweetness defines a cook and his/her expertise. He remembers many delicacies like ram saalan ( a curry with chickpea flour dumplings) that was made purely with vegetarian ingredients but was influenced by Mughal cuisine. Indrahaar and rasaaj were other dishes made of mixed lentils and were considered nutritious for the vegetarians. Nuts, milk products and lentils were the main protein source for everyone. Breakfast was called Kaleva, lunch was called Jyonar and dinner was called Biyari in older days and menus for seasons and festivals were followed strictly. Every family took pride in serving food to destitutes and saints every single day and kitchens and cooking were always planned keeping this in mind. Mrs. Aruna Raman, whose palatial home Raman Niwas is still a legend and who has guided many Chefs regarding Banaras cuisine, says it is the simplicity of the everyday food and the utmost respect for food being considered a blessing by Maa Annapurna that makes the food culture of Banaras special. She rightly says you wouldn’t find any Banaras resident boasting about the cost of the food, it is always the taste of the food that is celebrated dearly. Delicate cooking techniques and recipes are followed to get the perfection in food rather than showing off silver and imported ingredients on the table. Although a lot of spices and aromatics were imported in the older days as well, everything was used according to seasons and according to the guidelines of Ayurveda she says. Cooking food and dining was a sacred ritual, kitchens were the most auspicious place in the home after the place of worship. The family dining hall was sanctum sanctorum for several reasons. Family members could eat only after bathing, pickles were handled only by the cook who had to bathe before every meal cooked in the kitchen. Hygiene and quarantine was linked to religion in a seamless way. It is interesting how everyone respected these sentiments and no one took offence if one did not accept food at your place or was not served with the family for religious reasons. It is said that Maharaja Banaras (Dr. Vibhuti Narain Singh) did not even chew paan served to him by family friends as he observed strict dietary rules but as it was a tradition to greet guests with a tray of paan he picked one paan even though he would not eat. Paan is sacred in this city and is considered to cure all ailments however cliché it may sound. One thing that I find really overwhelming is that cooking and serving food was always considered a sacred act. Showing off the food or expensive utensils was considered cheap but great care was taken to serve the best foods of the season. Talking about the taste, recipes and ingredients was enjoyed enormously and the pomp about the best silver and crystal was subdued. There was never a dress code around dining rituals and people will be very comfortable in gamchha as well as sherwanis or zari kurtas sitting around the same table. Mr Mohit Saigal, who is the most successful CA in the city and belongs to another aristocratic family whose roots in Banaras date back to 10 generations or so, declares himself a foodie. He informs that non-vegetarian food was never cooked in home kitchens but it was liked very much by some families. Non-vegetarian food was strictly a shikar activity and people associated it with picnic food more for the same reason. Even though meat had to be cooked for the family, it would be cooked in the garden area where the family would eat the food like a picnic. Handi gosht finds its origin through shikar traditions and later adapted to garden cooking on wood fired chulhas cooked in earthen pots as the pot would not be allowed in the kitchen after cooking meat in it. Dr. Vijay Mishra, the Head of Department of Neurology at BHU and the 14th generation descendant of the Mahant family who has managed and guarded the Sankat Mochan temple since ages. 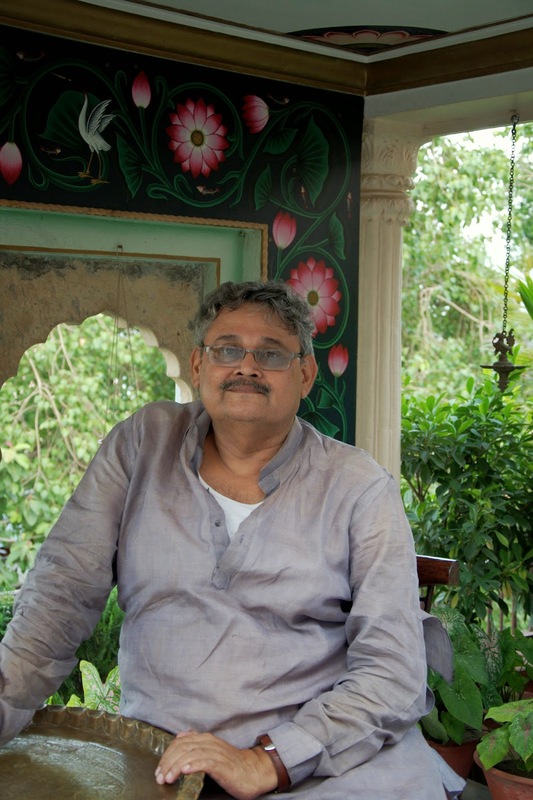 Dr. Mishra is a big foodie and remembers the Ramlila special foods he has tasted and enjoyed over the years. He remembers boondi wala dahi bada, miniature kachouris, chana jor garam, several types of chaats and dahi papadi served in leaf bowls that one finds in several locations of Ramlila. It is worth mentioning that several acts of Ramlila are played in varied locations of the city and the Raja of Banaras used to go to each of these locations to grace the actors and audience. Each of these Ramlila locations had specific foods that were sold by the same vendors year after year and people would throng those places to have a darshan of Ramlila characters as well as for the food. 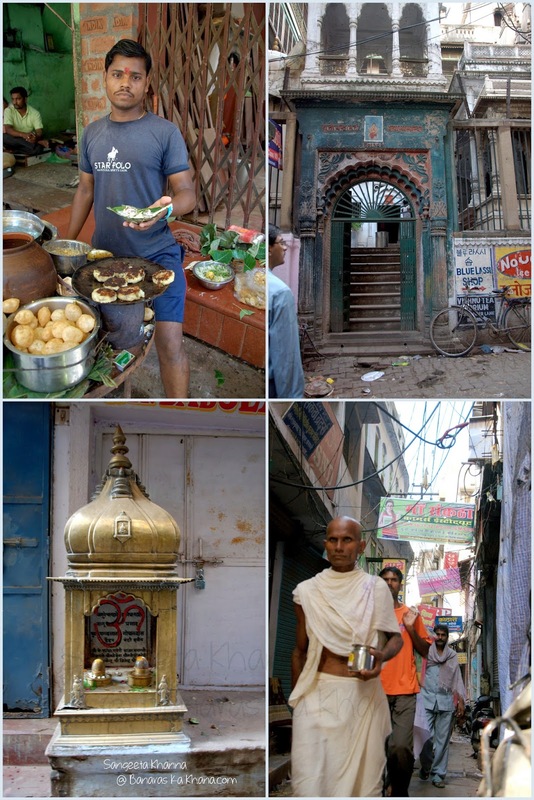 These food stalls were also patronised by the Raja of Banaras once but now the vendors carry on with the tradition out of religious feelings attached to it, although most of these Ramlila vendors have alternate careers for the rest of the year. Amazing narration.....falling in love with traditions, religion and spirituality all over again. Beautifully written! It feels as if I'm touring Banaras! The way you describe things and the way you cook show how passionate you are about food! Love your recipes and I've tried few of them too. Keep up the great work.